WHITE MARSH, Md. 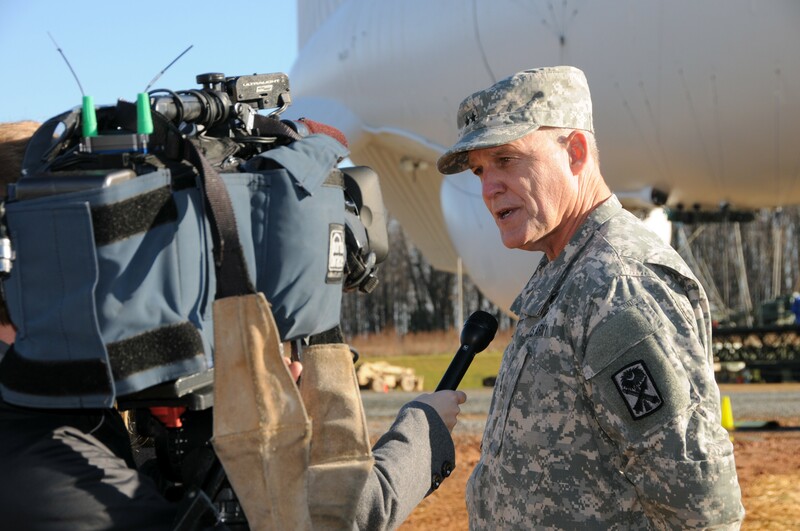 (Dec. 17, 2014) -- Sometime early next week, the Army expects to launch the first of two tethered aerostats from a ground base here, just north of Baltimore. The aerostat, part of the "Joint Land Attack Cruise Missile Defense Elevated Netted Sensor" system, referred to as JLENS for short, is a nearly 250-foot blimp-like vehicle that will stay aloft for a three-year evaluation period. The Army plans to launch an aerostat, part of the "Joint Land Attack Cruise Missile Defense Elevated Netted Sensor," in late December 2014. 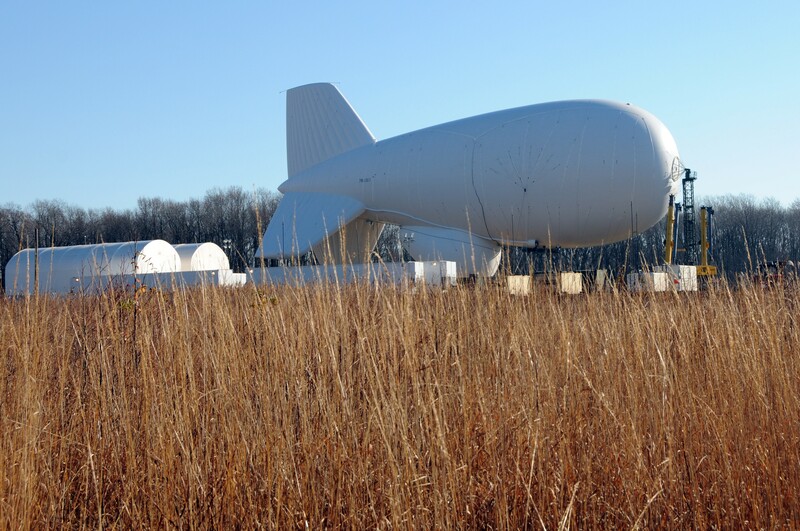 The JLENS aerostat will be tethered to the ground at Graces Quarters, part of Aberdeen Proving Ground, Md. It will float at an altitude of about 10,000 feet. The aerostat carries radar equipment meant to help better detect cruise missiles. The JLENS aerostat will be tethered to the ground at all times, and will float at an elevation of about 10,000 feet -- just less than two miles high. The vehicle is filled with helium, and is meant to keep a cruise missile-detecting radar system aloft. The system can detect cruise missile threats in an area that ranges from upstate New York to just a bit south of Norfolk, Virginia. During the evaluation period the Army hopes to show that the JLENS aerostat, which carries a radar system that can detect cruise missiles, can be successfully integrated into existing North American Aerospace Defense Command systems designed to protect airspace over the East Coast of the United States -- an area that includes New York City, Baltimore, and Washington, D.C.
A second JLENS aerostat will launch in late winter or early spring 2015. In the event that a cruise missile were to enter the area observed by the two aerostats, information gleaned from their systems would be fed into existing NORAD Eastern Air Defense Sectors systems and that information could in turn be used to bring down the cruise missile using aircraft launched munitions, ground-based air defense systems, or even an Aegis Combat System. "It is based on who can get the best shot possible," said Maj. Gen. Glenn Bramhall, commander, 263rd Army Air and Missile Defense Command, during a press briefing, Dec. 17. Right now, the purpose of the three-year evaluation of the JLENS system is to see how well it can integrate into existing NORAD detection systems. The JLENS system has already shown it is effective at detecting cruise missiles -- something it proved during evaluation on test ranges in Utah, said Lt. Col. William Pitts, with 263rd Army Air Defense Command. "We've already answered the question, 'Is it effective against cruise missiles?'" Pitts said. "There are plenty of tests that show we can see those things. Now the question is, when I put it here in the homeland and plug it into all the NORAD command-and-control systems, how does it integrate and how does it enable the other systems to do their job better? 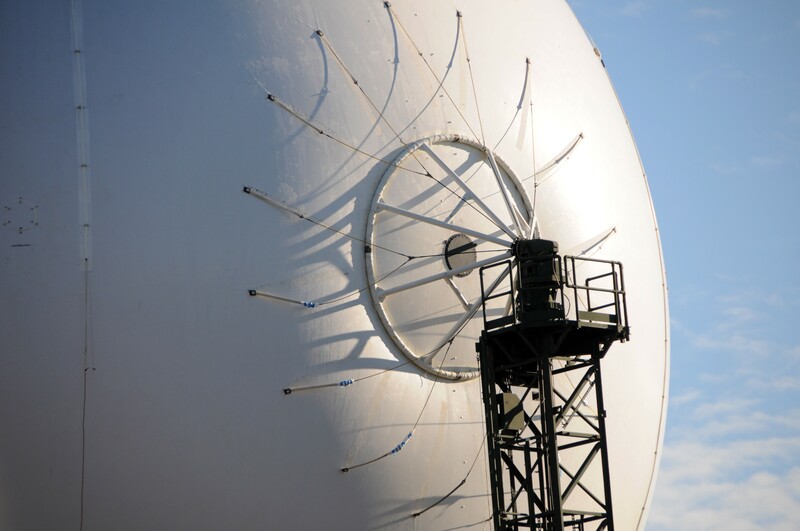 All those command and control nodes can leverage the data off the aerostat to provide some of that early awareness." From its 10,000 foot perch, the JLENS aerostats can get a more thorough picture of the area they are meant to protect than can ground-based radar systems. Current systems cannot see everything, Bramhall said, so what is needed is something that flies much higher in order to detect everything that could pose a threat. "Current systems do have limitations. One of the limitations we have is ... we have limited ability to detect," Bramhall said. "With an elevated sensor, such as JLENS ... [we have] the ability to look over the horizon, we have the ability to detect, and to enable our systems to defeat cruise missiles." In addition to its expanded coverage range, the JLENS system also provides persistent over-watch. The system stays aloft for 30 days at a time, coming down only for maintenance or severe weather. With the amount of time it can stay aloft, it is much less expensive than it would be to get the same capability via manned missions with an E-3 Sentry with the Airborne Warning and Control System, referred to as AWACS, or an E-2 Hawkeye with an airborne early-warning system. "Thirty days is so much better and cheaper than flying AWACS," Bramhall said. The increased capability of the JLENS system also means that airborne threats can be detected earlier than they can be now. This earlier warning provides ground commanders with more time to make important decisions. Maj. Gen. Glenn Bramhall, commander, 263rd Army Air and Missile Defense Command, spoke with members of the press during a Dec. 17, 2014, media day at Graces Quarters, part of Aberdeen Proving Ground, Md. During the media day, Army officials discussed the upcoming launch of an aerostat -- part of the larger "Joint Land Attack Cruise Missile Defense Elevated Netted Sensor" system. The JLENS aerostat will be tethered to the ground at Graces Quarters, and will float at an altitude of about 10,000 feet. The aerostat carries radar equipment meant to help better detect cruise missiles. "If I can detect this thing much further out, it gives commanders [more] time to get air assets into place and to alert people on the ground of the threat," said Bramhall. "If I can give a command four more minutes or five more minutes, that's a lot of time." The JLENS aerostats will both carry radar systems to detect cruise missiles, strobe lights to alert nearby aircraft of their whereabouts, and backup batteries to ensure operations in the event the ground power station fails. What the aerostats will not have is video cameras, said Capt. Matt Villa, JLENS plans and coordination officer. Additionally, said Villa, the JLENS aerostat carries neither weapons nor people onboard. About 100 Soldiers from Alpha Company, 3rd Air Defense Artillery, part of the 108th Air Defense Artillery Brigade, at Fort Bragg, North Carolina, will run the aerostat's operations. About eight Soldiers will be responsible for actual operations of the aerostat. Another crew will operate the radar system. The first JLENS aerostat is expected to be launched at Graces Quarters, part of Aberdeen Proving Ground, Maryland. The second will also launch at Aberdeen Proving Ground, in the nearby Edgewood Section of the installation.